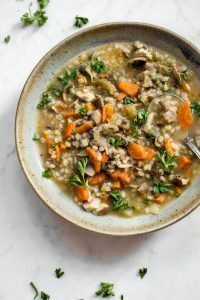 This mushroom barley soup is healthy, hearty, and deliciously comforting. It's easy to make, flavorful, and will warm you up! Prep your onion, carrots, and celery. Add them to a large pot along with the olive oil over medium-high heat. Sauté for 5-7 minutes, stirring occasionally. Stir the mushrooms into the pot and sauté for another 5 minutes. Add the Italian seasoning, garlic, vegetable broth, water, and barley to the pot. Increase heat to high and bring the soup to a gentle boil. Reduce heat to medium and simmer for 25-30 minutes or until the barley is cooked (it should be al dente, not mushy). Season with salt & pepper as needed. Garnish with parsley if desired. The barley in the soup will soak up more water the longer you cook it (and especially if you leave it in the fridge for a few days). If the liquid level gets too low, I suggest adding in more vegetable broth.